> New Social technology innovation marks next milestone for the e-bike industry. New Social technology innovation marks next milestone for the e-bike industry. A2B, the brand renowned for redefining the eBike industry, is this week unveiling eSocialBike, a new technology set to revolutionise the eBike owner experience. The technology, which will be previewed exclusively to the trade at this week’s Eurobike Show, taking place from 27 – 29 August in Friedrichshafen, Germany, was created by Sitael with the A2B customer firmly in mind. As well as enhancing every journey with route planning and GPS, eSocialBike gathers essential diagnostics and maintenance information direct from a chip housed in the bike’s battery compartment. The technology helps users stay on top of their bike maintenance with warranty notifications and live updates on how to use and charge the bike more efficiently to prolong its lifespan. It also provides a stream of real-time communication between the user, their bike and their local dealer meaning faster assistance and efficient solutions to any potential technical issues. This means owners and dealers alike have quick access to vital data to help solve diagnostic and hardware issues faster and more effectively. A2B Bikes General Manager, Fernando Kuefer, said: “Cyclists have long been used to using a range of different apps to give them feedback on their performance, but eSocialBike allows us to provide A2B customers with information on the performance of their A2B product as well as their journey. 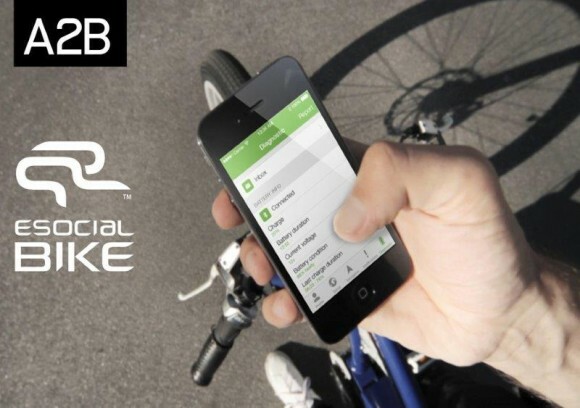 The eSocialBike app will be included in selected A2B models from August and also available as an upgrade for existing owners of compatible A2B bikes. The app is available to download from August for free on iPhone and android smartphones. Attendees at the Euro Bike Show will have an exclusive opportunity to trial the technology prior to general release – just visit the Sitael stand to find out more. Further feature updates for the app are planned for early 2015.